. We happened upon Cilea the first day I went searching for my pizza school. It was late in the afternoon, the place was empty, and I had eaten only two hours before. But I decided to give it a shot. I knew after the first few bites of my margherita that I was eating something special. For the rest of the afternoon, I couldn't stop talking about how surprisingly distinct the tomato sauce was. 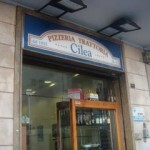 Now I've been going there for over two months and I'm convinced that Cilea has the best red sauce in Naples. Cilea: dense, moist, bold, chewy, airy, succinct, whimsical, doughy. Sorbillo: crisp, resilient, pliable, resourceful, doughy. As for the cheese: The fior di latte was remarkably creamy without causing the same soupy effect that mozzarella di bufala causes (I've got to say "soupy" at least once in each review). The sauce: What can I really say except that I'll have another thing to weep over once I leave Italy. It was distinctly salty without going overboard. I've noticed, even in Naples, that tomato sauce is often used as a filler. But this stuff took command of the pizza and everything else was a delightful aftertaste. At first, I was afraid the pizza bianca would pale in comparison to its red brethren. But I was quickly proven wrong. The arugula was fresh. The parmigiana was strong, and the red sauce was replaced with extra virgin olive oil and seasalt. If you want the best white pizza in the world, go to Pizzeria Bianco in Phoenix, AZ. If Bianco's is closed, hop on a plane towards Naples, go to Vomero, and try the pie at Cilea. End Note: Cilea also takes the award for having the most bang for its euro. At 2.60 euros for a margherita to-go, you might as well order four. I will give Trattoria Pizzeria Cilea 7 out of 8 slices. Only thing keeping this from getting a perfect 8 slices, is the fact there are way too many pizza places I haven't tried around this region.